Lent is not something I grew up celebrating, but I feel that for many Christians the Easter season is not celebrated the way it should be, considering the importance of the Resurrection to Christians. I'm glad that the kids enjoy the egg hunts, Easter bunny, and all the other spring-like festivities, but I want this season to be about more than the commercialized interpretation of Easter. In an effort to change that for our family, we decided to celebrate Lenten Lights, the week-long version. I thought it might be more fun and attention-grabbing for the kids if we let them make the lights. 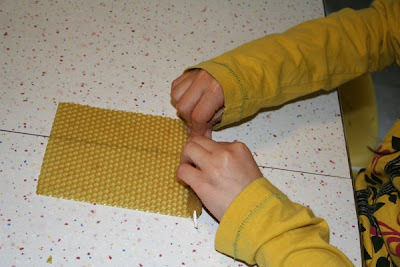 We got beeswax candle-making sheets from A Toy Garden, as well as some decorative beeswax. We laid the sheets on the table and blew them with a hair dryer for a minute to soften the wax a bit. Then we slowly rolled the beeswax sheets around a wick. 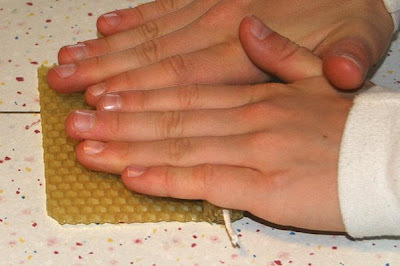 After we had rolled all of our candles, we broke the decorative beeswax into chunks and pressed them into our candles. The finished candles turned out quite colorful, and I'm sure the Lenten Lights will be that much more meaningful for the kids since they had a hand in creating the celebration. You said it, my hubby don't like the way Easter exactly for the reason you described. oh, how pretty the candles are. Do they also smell nice? We dipped beeswax candles once at a fair in a walodorf school and I thought the lady told me it will also smell nice but I don't think I smelled anything or maybe the scent is too light? 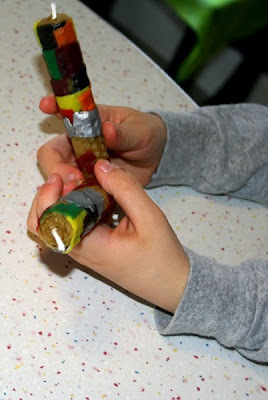 We love rolling beeswax too. Your candles turned out great - love all the colors! They turned out very pretty. I think this is a great way to get the kids to internalize the holiday that you are celebrating. our favorite part of using this wax is its smell! i want to lick it and eat them. 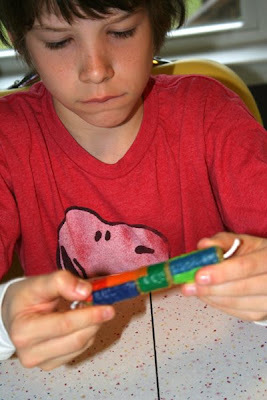 it's such a great activity for mixed ages because it's so easy to work with. 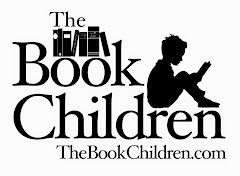 What a great way to get your kids involved. Thank you for the link to the Lenten Lights readings. John Piper...I'm starting to get the idea that we have a lot in common. 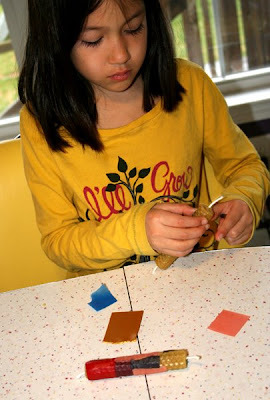 :) I also have been looking for something to use with my kids for Holy week, and this looks like it would be perfect. Those are lovely. Let me know if you find a local beeswax source-- I want sheets as well as something to make a cream with! 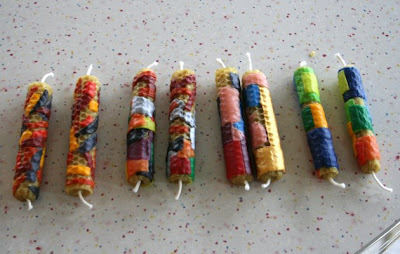 These are beautiful, we have rolled beeswax candles before, but haven't decorated them with the decorative wax yet. They look painted, they are gorgeous. Where do you purchase your beeswax sheets?? Those really are just too cool! Very pop art!